It feels perfectly natural to be welcomed into Venice on a floating taxi and a sea of culture Sarah Vilela da Silva discovers, as she sits back and enjoys a trip around the Venice Lagoon. 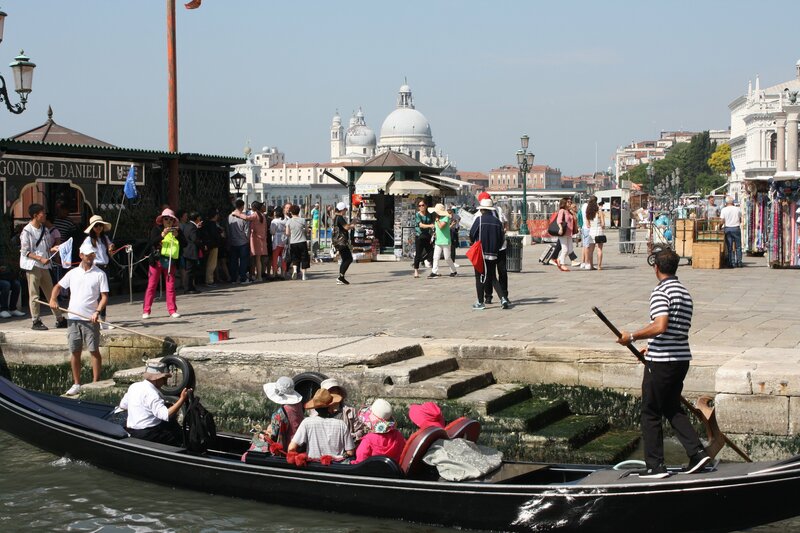 Our water taxi carries a mix of locals and tourists, and it doesn't take long for us to be swept up in Italy's style. We travel past islands and colourful houses before landing at Murano, famous for its glass-blowing and where our home for almost a week is moored. Our catamaran holiday seems too good to be true as we realise there is more to Venice than canals and crowds. The city is part of the broader Venice Lagoon and the lagoon's islands are just like mini-Venices, with just as much charm and character as their big cousin, if not more. Our skipper Shayne takes us to our first Italian supermarket to stock up and it's not an experience to rush. We load up on items that are everyday European food but delicacies for us, and we can't believe the price: buffalo mozzarella for 0.80 (about NZ$1.30) each, packets of prosciutto ham for 2-3 (NZ$3.20 to $4.80) and bottles of Moscato wine for 5 (NZ$8). Skipper Shayne Hitchcock (right) attends to his catamaran Kiwi Breeze in the Venice Lagoon. We have an afternoon snack on the boat of platters and wine - a prime example of easy living in our own portable paradise - and then head out for dinner in Murano that night. The glass-walled, waterside restaurant was perfect for the sunset and had suitably handsome Italian waiters. Pizza options took up eight of the menu's 15 pages, but we added some other Italian delights too: gnocchi with three cheeses, mussels and calamari, and a classic seafood pasta, for which the waiters brought large paper bibs which they tied around our necks. It was all washed down with a complimentary shot of limoncello, the perfect palate-cleanser and the perfect way to end our first night. On day two we head to Venice, truly embracing our inner tourist. St Mark's Square was amazing, causing our senses to go mad and showing what architecture could be. The buildings had fine gold leaf, tile mosaics, shimmering arches and paintings that capture your eye. There were lots of people, but there was enough space for all, although we spotted one piece of important advice for future visitors - if you want to visit the incredible St Mark's Basilica book your trip ahead of time online (at least a day before). You will avoid the long queues, and slip in quickly through a side entrance. St Mark’s Basilica wows in St Mark’s Square. As a coffee drinker, the smell of good espresso in the square will draw you in, although the price will seem steep. After leaving St Mark's Square we spent most of our day in the back streets, navigating our way through gelato, Gucci and gondolas. Venice, which dates back to 400AD, is the capital of northern Italy's Veneto region, and as most tourists know has no roads, just canals, including the busy Grand Canal thoroughfare. The tourists now overtake locals by the millions - in 2017 Venice's population was estimated at about 270,000, but it gets an unbelievable 20 million tourists a year. But you can still find a quiet spot for lunch. We find a hidden gem overlooking a quiet canal, a great place to take in as much of Venice as we could. Our next day in the lagoon is all about the boat. We head south to the seaside town of Chioggia, in absolutely no rush, enjoying a quiet day on the water, an evening admiring more town squares, colourful houses and canals, and docking at Chioggia's marina that night. The next day is Sunday, still the day of a traditional family drive after lunch for many, but in Venice it's done on the boat. We share the water with a procession of criss-crossing boats filled with Italian families, as we return north and head for Burano. Multicoloured houses line a canal in Burano, in the Venice Lagoon. The island of Burano is known for its colourful houses, said to be from a (wonderful) law that doesn't let anyone paint their house the same colour as their neighbour. It has created an island that looks as if it's been painted by children, in the best possible way. We arrive late in the afternoon but the late afternoon glow that illuminated the colourful houses made for something quite special. Pizza and a beer makes a perfect meal in Burano. Dinner that night was pizza in a small restaurant in the town square, surrounded by local children playing football against the church wall, and old men solving the world's problems over espresso and limoncello. We decide one day in Venice isn't enough and return to the city the next day, where St Mark's Square has more interesting sights and a range of tourists: we see nuns taking each other's photos, and a just-married couple having wedding photos taken. We wander around the canals again, downing 1 canolis (tube-shaped shells of fried pastry dough filled with a sweet, creamy filling) and more espresso, buying leather gloves and shoes and admiring the Venetian masks on sale. On our last day we return to Murano for more glass-blowing and good food by the canal. We wandered around the island, covering nearly every shop open, and resting at a canalside restaurant for lunch. Our family sat and enjoyed our usual amount of wine and food, and talked over what we thought of our first trip to Venice. One week was the perfect amount of time and I couldn't recommend a visit to the Venice Lagoon more. Former Central Otago student Sarah Vilela da Silva moved to Europe earlier this year and is now working, studying and writing in Dublin. Boats glide down Venice’s Grand Canal.